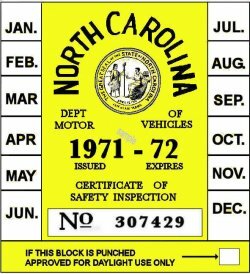 1971-72 North Carolina INSPECTION Sticker - $20.00 : Bob Hoyts Classic Inspection Stickers, Add a Final Touch to your Restoration! This 1971-72 NC sticker is an exact reproduction of an original we have in our archives. We recently (March, 2009) corrected this sticker, earlier thought to be a different color. For an additional $10.00 we can customize this sticker with your License plate number in the box that now has the NO. on it.